Product prices and availability are accurate as of 2019-04-10 19:00:14 EDT and are subject to change. Any price and availability information displayed on http://www.amazon.com/ at the time of purchase will apply to the purchase of this product. 6' - 9' Vines With 'winged' Stems. 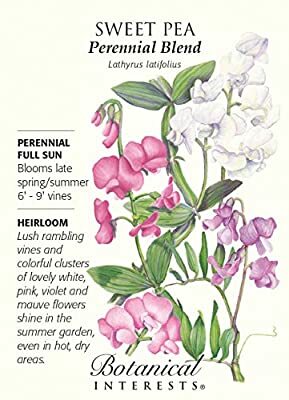 Flower Colors Range From Purplish Pink To Purplish Red, Perennial Sweet Peas, Have Slightly Smaller Flowers (1.5) Than Annual Sweet Peas, But Their Charming Reappearance Each Spring More Than Makes Up For Petite Size. An Excellent Solution For Those Of Us Gardeners That Tend To Forget To Plant Annual Sweet Peas Early Enough Or Have Trouble Getting Outdoors In Early Spring To Plant Due To Weather Conditions. Perennial Sweet Peas Are Also Known As 'everlasting Peas'. Note That In Some Climates, They Are Very Prolific And Must Be Watched To Make Sure That They Don't 'escape' From The Garden.